March 8th marks International Working Women’s Day, a date celebrated by many peoples of the world. It is a major global celebration that acknowledges the economic, political and social achievements of women and the just demands for equality, justice and dignity. The first celebration of International Working Women’s Day was put forward at the turn of the 20th Century to commemorate the valiant struggle of women workers in the garment industry of New York City, during a period of rapid world industrialization and economic expansion that led to protests over working conditions. On March 8, 1857 in New York City, garment workers protested what they saw as very poor working conditions and low wages. On March 8, 1908, 15,000 women marched through New York City demanding shorter hours, better pay and voting rights. In 1910, the first international women’s conference was held in Copenhagen by the Socialist International and an “International’s Women’s Day” was established. Today, women continue to struggle for justice, dignity and equal rights, demanding to end to exploitive policies that infringe on the physical and psychological integrity of women. Women are workers, educators, amas de casa, health care advocates, organizers, students, compañeras; our aspirations are filled with a rebellious nature and deep convictions, our voices cry out for a new and better world, where we can expand liberating ideologies and build new ones. We know that we will face the persistent threat of oppression and exploitation. It is precisely because of that, that women have always been and are now at the forefront of combating these terrible conditions. This is what makes a revolutionary woman that much more needed in the struggle to build a socialist society where we can combat violence and ensure that progress and solidarity flourish. We reject that war and prisons must be the future for our children. We reject the World Trade Organization, the International Monetary Fund, and World Bank, imperial Free Trade Agreements, all designed to continue to subjugate the vast of majority of humanity, and women in particular. Imperialism has imposed its neo-colonial dominance of the “Global South” and disempowers the world’s working masses and people. These institutions of the rich ruling classes are the reasons that women’s rights and unions, living wages and benefits, humane working conditions and basic rights still do not exist for the vast majority of humanity, subjecting workers to displacement and exploitation. We say enough is enough. We don’t want to be uprooted from our homes, forced to work in far away lands, subjected to violence. We know that we must stand firmly in the belief that equality, respect and dignity can only be obtained through national liberation, a quest for self-determination, with equal standing as women. We know that we must overturn capitalism and colonialism for women to be free, equal, and to win respect and dignity. It is up to all of us to keep focus on that goal. 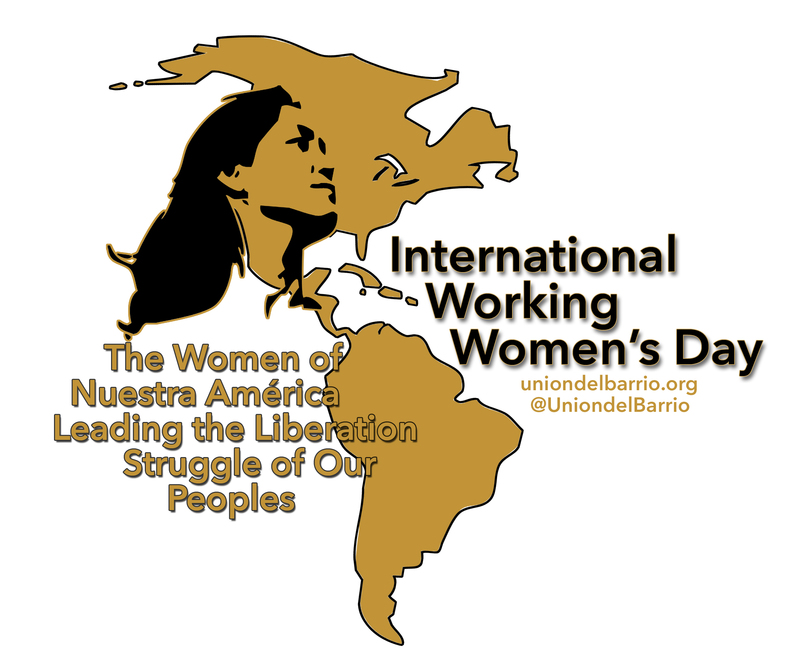 Compañeras, we thank you for your renewed and strengthened commitment to resist and struggle against exploitation and oppression. The Life of Patricia Marín. Ley Revolucionaria de Mujeres (EZLN). AguilayCondor.net was established as a resource for the introductory political education and ideological formation of Unión del Barrio members and supporters. Its content is posted under the direction of the Comité Central of Unión del Barrio. This entry was posted in 2015, 2018, Analysis, En Español, History, La Mujer News & Events, Labor News & Events, Organizational Updates. Bookmark the permalink.